Smoke Alarm with Backup - SHIPS FREE! 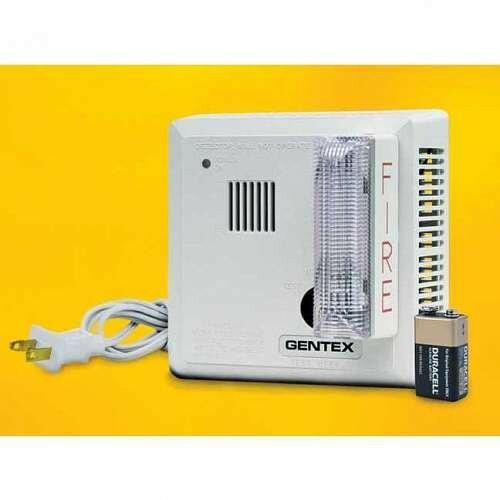 Gentex 7139LS Wall Mount T3 Smoke Alarm with battery backup requires no hardwiring in order to be set up. Installation is easy, simply plug in the extended 9 foot AC power cable to an outlet and mount up on the wall, no handyman or electrician required. A power backup runs on a 9-volt battery that is included in the package if the power goes out, the audible alarm will go off in the case of a fire or smoke is detected within the vicinity. A powerful flash alarm strobes at 60 times per minute to alert those who are far or deaf and the T3 evacuation tone is familiarized by most. In an emergency, the best alert system is one that can reach the majority. Keep yourself and your loved ones safe in the case of a fire with the superior warning ability of this smoke alarm. Gentex 7139LS Smoke Alarm Manual contains user manual instruction.